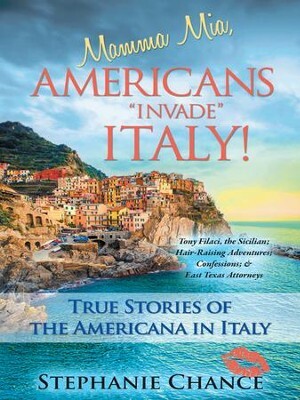 This book contains hilarious, hair-raising, and true stories of what Americans do in Italy. Hop aboard with Stephani Chance and her Sicilian papa Tony Filaci for the most magical and fairytale adventures of your life as they take you to Italy and beyond. After fourteen-plus years of taking groups of Americans to Italy twice a year, Stephani finally shares some of the “true stories” of what the Americans experience on her Italy tours. These true and unbelievable adventures will take you on a ride like no other. You will be speechless as she takes you to hidden jewels inside the remote parts of Sicily and, while holding on tightly, you zigzag to amazing places all over Italy. You will eat with family and friends for the Last Harvest of the Grapes and dine with a genuine count in the rolling hills of Tuscany. You will laugh until you cannot anymore, and then you will stand in awe when she takes you inside places that existed before Christ; such as Little Jerusalem, located in a remote area of Italy. Come on—hop aboard with Stephani, ride with the Americans off the tourist paths, and stay in fairytale places that will remind you of stories such as Jack in the Bean Stalk. Hang on to your seat as you explode with every imaginable emotion that will surely ricochet from hilarious laughter to spellbound tears. While you’re still begging for more, Stephani will take you behind the “pine curtain” of East Texas, and reveal an intimate look at how the flip of a magazine page moved her out of the legal world into this life of travel and adventure. I'm the author/artist and I want to review Mamma Mia, Americans Invade Italy! : True Stories of the Americana in Italy - eBook.